The whole world seems to have gone stir-crazy for contouring in recent months and multiple brands have been jumping on the bandwagon by releasing contour kits. Once the favourite pasttime of the Kardashian clan, the masses have embraced sculpting and highlighting, casting shadows and shining light to create cheekbones and make faces appear more structured. 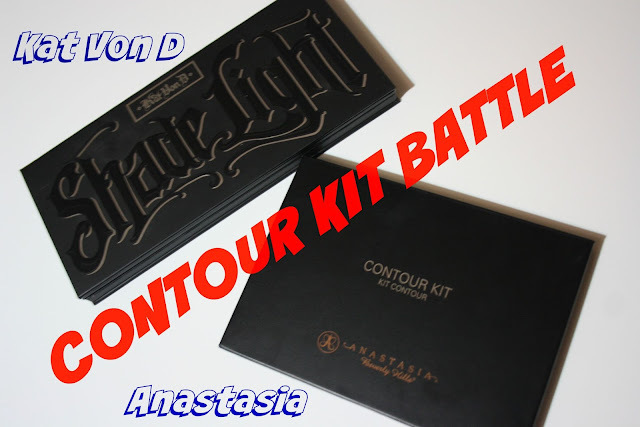 Two such contouring kits to have been released in recent times to appease contour seeking customers are the Anastasia Beverly Hills Contour Kit and the Kat Von D Shade and Light Contour Kit. I have both, and I am often asked which one I prefer and which one I would recommend, so I am compiling my thoughts into a post. The Anastasia Beverly Hills Contour Kit was one of the first contour kits on the market. It comes in three different varieties, Light/Medium, Medium/Dark and Dark/Very Dark- of which I have the Light/Medium version. This is available for us on this side of the Atlantic from Cult Beauty for the princely sum of £39. The palette contains three highlight shades- Vanilla, Banana and Sand, and three contour shades- Java, Fawn and Havana. The external packaging of this palette is good, nice and compact, and the fact that the colours are individually interchangeable and replaceable is a great touch, even if the individual colours are £14 each on Cult Beauty. The powders are a bit too hard for my liking, it takes quite a bit of work to pick up the product and a few applications to build up some pigment. The highlighting powder Vanilla tended to dry out my undereyes a bit, Banana made me look like Marge Simpson under the eyes and Sand was very appropriately named as it feels quite gritty and has some specks of glitter and I would never put anything glittery under my eyes as I wouldn't want it accentuating those pesky fine undereye lines. 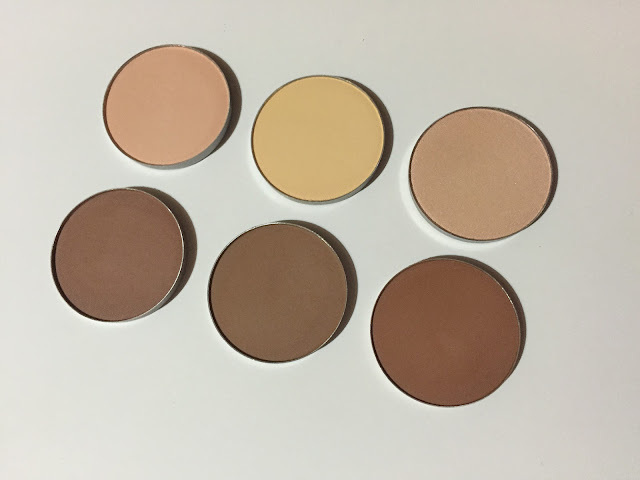 The contour colours are a little too warm for my liking also, Fawn is the only one that is slightly grey toned and Java and Havana, whilst both being too warm to be a traditional contour, are too similar to each other on the skin to justify having both in the palette. Again, these are quite poorly pigmented and it takes quite a bit of work to build up the colour. The Kat Von D palette is exclusive to Sephora and costs $46 dollars, and luckily for us on this side of the pond, Kat Von D is one of the brands that Sephora will ship to the UK (which means Ireland via Parcel Motel). The packaging is sturdy with a huge mirror in the lid and a decent magnetic closure. Like the Anastasia Beverly Hills palette, there are three highlight/light shades- Lucid, Lyric and Levitation- and three contour/shades- Subconscious, Shadowplay and Sombre. As you can see from both the palette and the swatches, each of the six shades is sufficiently different to justify their place in the palette. The lighter shades simply do not compare to the Anastasia palette- the yellow toned Lyric is a far better tone and smoother in texture than Banana from Anastasia Beverly Hills palette- and the other two shades are chunky glitter free and smooth and brightening under the eyes. Speaking of smooth, these powders are incredibly finely milled, buttery, soft and blend beautifully on the skin. 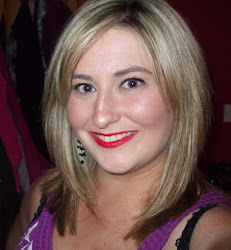 The Kat Von D powders are far more pigmented and easier to apply than the Anastasia ones. The contour shades in this are perfection in my mind- Subconscious is a fantastic shade for us pale skinned folk, Shadowplay is that perfect blend of cool and warm and Sombre is perfect buffed out when you want a more harsh contour look. Each of the six shades in the Kat Von D palette is impressive and creamily easily to apply and blend. There is no doubt but that these are very fine contour kits, but if I could only choose one of them, I think I would go for Kat Von D, as I prefer the shades, the formula. Whilst Kat Von D wins by a mile, one thing I really do appreciate about the Anastasia Beverly Hills palette is that the colours are individually replaceable, so you can replace your favourites. Still and all, I would rather pay the full price for a whole Kat Von D palette instead of replace just one Anastasia powder. The pigmentation and payoff are way better in the Kat Von D palette than they are in the Anastasia palette. The Kat Von D palette has become a firm favourite in my collection and I'd have no qualms in recommending it to any of my readers. Are you still onboard the contouring train or has the train passed for you? What contour kit has been floating your boat? I have been wondering about these two, thank you SO much for sharing! I think I will pick up the Kat Von D one for sure.